I think we've all had our moments of obsession with the work of Benjamin Dhong. But I just can't shake my desire to look at his work. Which is really heavy praise when I consider myself a talented designer. What is it about his spaces that I love? They are both outlandishly luxe and restrained at the same time. Each piece is exquisite in its own right... but there's a quiet sphistication as well. Nothing is overdone even though on their own merit each piece is carefully designed, collected or selected. His rooms are lyrical, beautiful and completely livable. We share an appreciation for pile fabrics, antiquities and patina. And there's something to be said for adding a black occasional piece with gilded accents to a room. Instant wow! 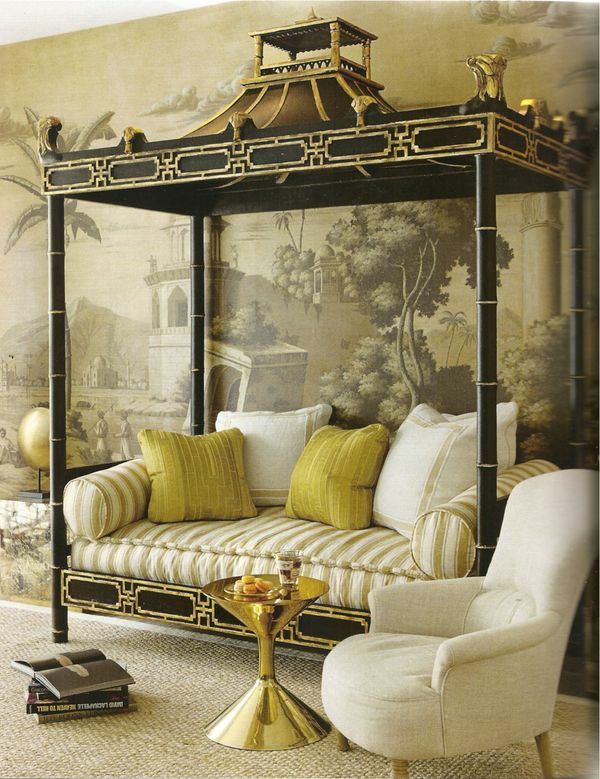 Now, unfortunately, I am truly and completely obsessed with the chinoiserie daybed at the top. Ideal for nurseries, guest bedrooms or libraries. I need one. His was sourced from Michelle Nussbaumer's Ceylon et Cie - one of the best shops here in Dallas. I'll have to nudge Michelle to see if she can find another one on one of her many journeys. For now... enjoy a little more Benjamin here.